Anything you teach us would be appreciated Sara; however, I would have to vote for the Navel Shell. I cannot wait! Could you show us how you folded the 4|10|10? And maybe possibly post the template online? 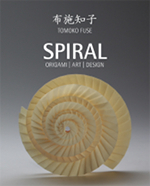 I also love orgami, I have many origami books.I love this book ,Can I contact you? Do you know how I can get this book in America? It seems like none of the websites will ship it to the U.S.